Yagaloff (third from left) joined students (from left) Greg Kies, Ryan Norris and Lauren Park at the award ceremony. 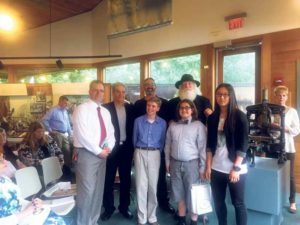 Seventh- and eighth-grade students from Plainview-Old Bethpage School District’s Plainview-Old Bethpage Middle School were recently selected as winners of the Walt Whitman Birthplace Association’s 13th annual Student Poetry Contest. 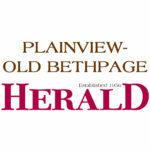 Among the winners from Plainview-Old Bethpage Middle School were Gregory Kies, who was selected as the Grand Champion for grades seven and eight, and Lauren Park, who was selected as the winner for grade eight. In addition, Gregor Reinbold’s eighth-grade class won for its class anthology of poetry. For the contest, the students were challenged to submit original poems based on Walt Whitman’s work entitled, A Child Went Forth. Students attended an awards ceremony at the Walt Whitman House to celebrate their recognition with their teacher Reinbold. Participating in the prestigious poetry competition is one of the many ways the Plainview-Old Bethpage School District encourages students explore their creativity and to enjoy literature.